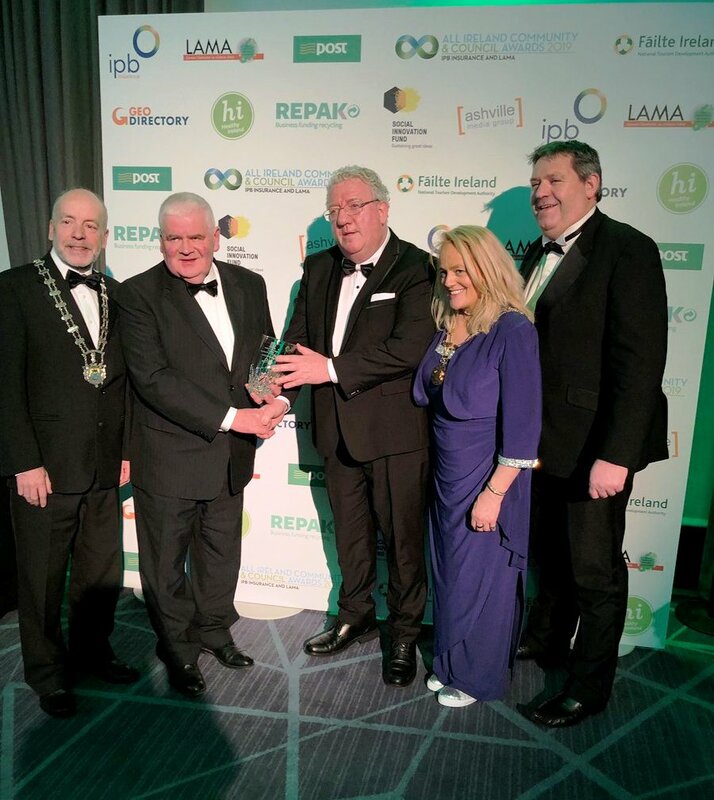 The All-Ireland finalists for the 2019 Community & Council Awards presented by IPB Insurance and LAMA (Local Authority Members Association) represented their counties in Croke Park on Saturday 9th February 2019. For thirteen years these awards have grown in popularity nationwide, celebrating communities and councils working together and for the second time the event was held in Croke Park for the All Ireland final and was aptly hosted by RTÉ’s national treasure, sports commentator, Marty Morrissey. It was an extraordinary year for entries with over 150 nominations received! Following an in-depth judging process over 100 projects nationwide from 22 counties were shortlisted across 25 categories. Cllr Sean McGowan, Cathaoirleach, Leitrim County Council stated ‘It is wonderful to see the recognition given to Comhairle na nÓg and the young people of Leitrim for this excellent project. The video is very powerful due to the heartbreaking contributions of the Dolan and Grogan family and I hope that this video will be taken up by the Dept of Education and shown to all secondary school children throughout Ireland’. LAMA is the Local Authority Members association. They work in the best interests of its members at all times and as an organisation promotes the interest of local authority members and is involved in a number of initiatives throughout the calendar year. As a wholly owned and managed general insurance company, IPB Insurance is proud to be the leading insurer in protecting local communities across the length and breadth of Ireland. We serve local authorities and national government bodies as well as underwriting risk for private commercial business, expert representative bodies and associations. In so doing we pride ourselves in serving and protecting those who in turn serve and protect the Irish public.